October has been a fun month so far. 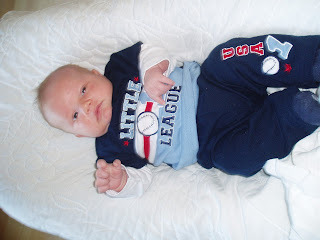 Nathaniel has doubled his birth weight, and is a happy boy, just learning how to smile. 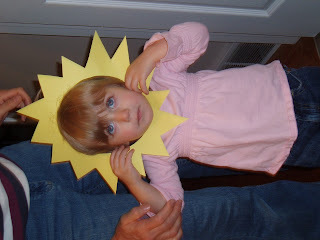 Kayla loves to sing, so Grandma Day made her a sun to sing "Jesus wants me for a Sunbeam." She loves to sing Popcorn as well. 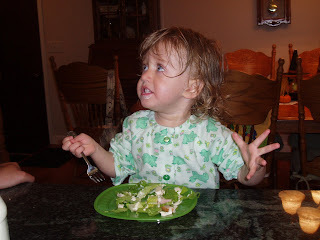 One fun discovery is that Kayla loves to eat salad. She is a very healthy eater, although the other day she found the icecream scoop and stood by the door that goes out to the freezer in the garage and kept saying "Cream'. She gets that from Spencer. He loves ice cream, too. 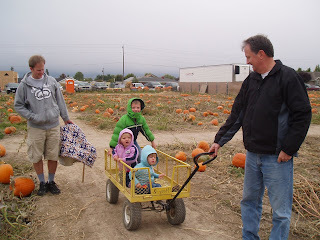 Spencer, Kayla, and Nathaniel went to a pumpkin patch with Grandparents Day and Cousins Degory and Eliza. Kayla has so much fun outside. I was sad to miss that, I have started back at work at the LDS Distribution Center. Nathaniel is getting so cute!